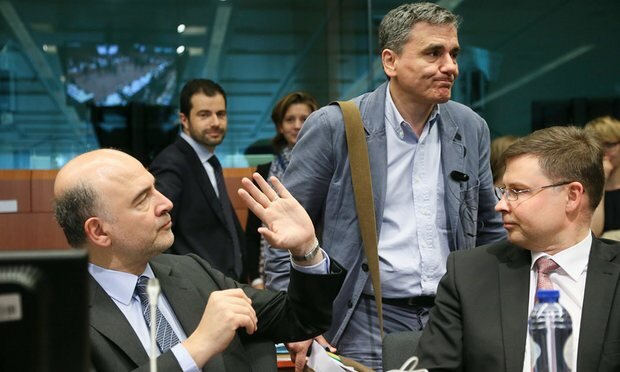 Greek Finance Minister Euclid Tsakalotos is going to Monday’s meeting of euro zone finance ministers hoping to get a date for the return of creditors’ representatives to Athens to negotiate the completion of the bailout program review. Greek government officials say that Tsakalotos is working on an initial agreement on principle, adding that if euro zone finance minister agree, the team of lenders’ representatives can be in Athens as early as next week. The Eurogroup, which starts at 4 pm, will discuss the exact measures Greece will need to legislate in advance for 2019 in order to meet the fiscal targets set. According to EU officials cited by Kathimerini daily, in order to unlock negotiations on the bailout program review, Athens should accept to lower the tax-free income threshold and the abolition of the personal difference in pensions, measures that should be implemented in 2019 and onward. To balance the above measures, creditors have proposed that Athens can proceed with tax cuts, but only under the condition that the country achieves a 3.5% primary surplus. The Greek government is willing to accept the reduction of the tax-free income and make the abolition of personal difference in pensions a contingency measure if the fiscal targets are not reached. Other issues that remain open are labor law reforms, including mass layoff percentages and collective bargaining. Greece also has yet to liberate the energy market, including privatization of part of the Public Power Company (DEI) and the power grid (ADMIE). In addition, Athens has to commence the operation of the independent privatization fund. The International Monetary Fund insists that Greece must implement additional measures worth 2% of GDP, or 3.6 billion euros approximately. Athens is adamant that no new measures will be taken. The completion of the evaluation and creditors’ agreement on unlocking medium-term debt measures are conditions for the integration of Greek bonds in the European Central Bank quantitative easing (QE) program.